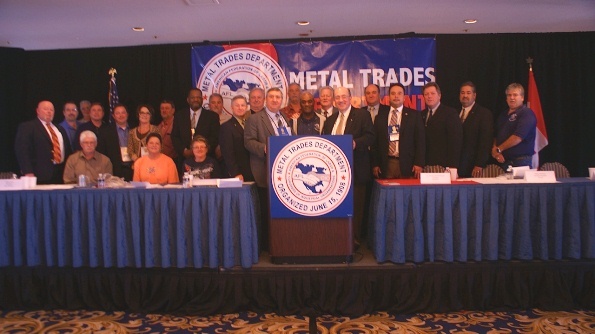 The IAM had more than 25 delegates at the 69th AFL-CIO Metal Trades Department Convention. The MTD covers union members in key sectors of the economy, including the Department of Energy, Department of Defense and shipbuilding. 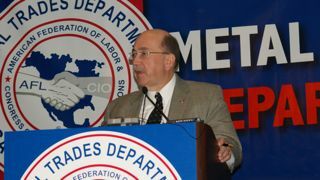 Delegates to the 69th Convention of the AFL-CIO Metal Trades Department (MTD) re-elected IAM International President Tom Buffenbarger as MTD’s 1st Vice President. Also re-elected were Ron Ault as President and ten other incumbent members of the Department’s Executive Council. Buffenbarger addressed the Convention and described the IAM’s struggle with The Boeing Co. and conservatives in Congress who are intent on undermining the National Labor Relations Board. Convention delegates also voted on proposed changes to the MTD Constitution. A resolution submitted by the IAM to expedite action taken in cases where a voting imbalance in Metal Trades Councils exists passed unanimously. With more than 25 delegates, the Machinists Union was well-represented at the Convention. Included were IAM Executive Council members and IAM representatives who service IAM-represented workers at the Department of Energy, the Department of Defense and in the shipbuilding industry throughout the United States. The IAM has a long history with the Metal Trades Department going back to its inception in 1908.